I like AVOKIDDO apps. I’ve reviewed Bec and Bo, Avokiddo Emotions, and ABC Ride. Today I’d like to tell you about Thinkrolls, also by AVOKIDDO. It's both an iOS and Android app. Kids will have a blast navigating their Thinkrolls through a series of obstacles in brightly patterned mazes. Each chapter introduces a new object with unique physical properties which kids discover through hands-on manipulation. Little players encounter and use to their advantage force, acceleration, buoyancy, heat, elasticity and gravity to get their Thinkrolls where they need to go. Thinkrolls has all the trappings of popular platformer and physics puzzlers, but it incorporates a wealth of educational content. It appeals to children’s natural curiosity and challenges them with gameplay that fosters creativity and out-of-the-box thinking. Each of the 90 easy and 90 harder levels gradually build upon successive lessons to strengthen observation, reasoning, problem solving, spatial cognition and memory. The little rolling characters in this physics-based game are seriously cute. I LOVED the undo button because even though I was playing at the easiest level (! ), I made mistakes and could undo them once I realised what I should have done. The sounds weren’t annoying. There’s an easy mode for children 3-5 and harder mode for kids 5-8. Best of all, I appreciated the thought that had gone into making the game just right for young players: not too hard so as to frustrate them, earlier levels training them in the game, opportunities for learning from mistakes, and learning to plan ahead logically with causes and effects. I am genuinely conflicted over us encouraging children under 5 to be involved with screens. Paediatricians seem to be saying it’s not good for them. However, I guess I am on the side of balance. So long as young children get lots of fresh air, physical play, stories, chats, songs and cuddles, so long as adults don’t use screens as a baby-sitting device, then in my opinion a little supervised screen time is probably okay. Generally I like to find apps that encourage kids to create something. While Thinkrolls doesn’t lead to something created, what it does lead to is lots of creative and critical thinking in an app that’s really fun to play. So I’m giving it the coveted Book Chook Feather of Approval. 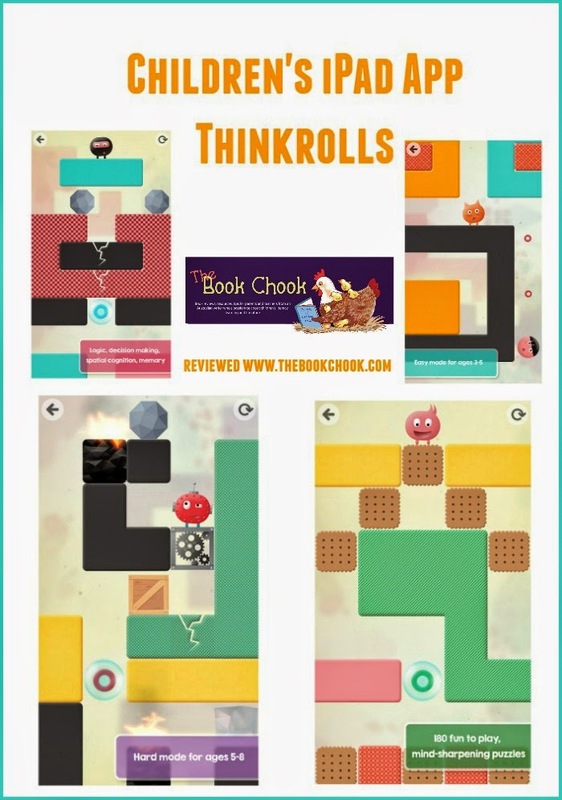 I'll be adding Thinkrolls to my list of iPad Puzzle Apps for Kids. If you've enjoyed this post, or any others at The Book Chook, I'd love you to help me spread my literacy, learning and literature ideas by promoting via Twitter, Pinterest, Facebook, StumbleUpon, G+ or any other way you decide.